“All-day Battery Life” is a challenging feat to achieve these days. 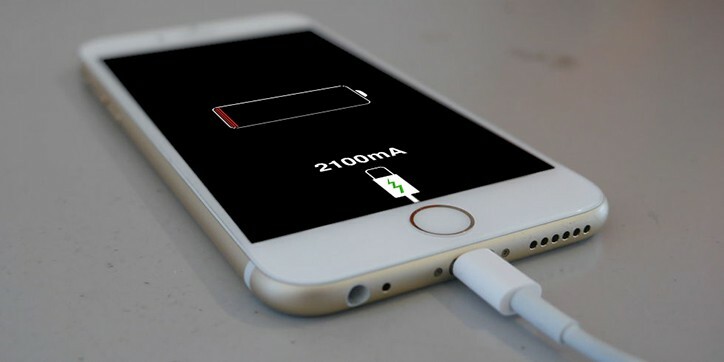 And while the competition focuses more on larger batteries and fast-charging, Apple focusses on efficient use of resources to help their iPhone run longer. No doubt, this approach is quite a good one, but fast-charging can indeed prove essential, when you’re running out of battery and you still have a significant part of the day at hand. What if I told you, that the iPhone is in fact capable of “fast-charging”? Apple officially supports it. It’s just that they never explicitly told you so! Fast charging is a feature supported on certain mobile SoCs, to charge devices faster than conventional USB charging rates. There are two major requirements for a supported device to undergo fast-charging — high power output from the charger, and the capacity of the device to draw that power. To help you understand this concept better, here’s some technical background. Smartphone chargers are generally rated according to their Power output P (measured in Watts, W), which, in turn, is a product of two independent factors, Voltage V (measured in Volts, V) and Current I (measured in Amperes, A). Note: A standard laptop USB 2.0 port can provide a current output of 500mA, while USB 3.0 supplies up to 900mA current; both operating at around 5V. If a smartphone is capable of drawing 2000mA or more current, it can be considered to be fast-charging compatible. And though all iPhone currently ship with the standard 5W (Output: 5V ⎓ 1000mA) charger out of the box, some models are capable of drawing up to 2100mA current, and hence support fast-charging. Note: Even though the iPhone SE was released after iPhone 6S / 6S Plus, it is only capable of drawing up to 1000mA current, and hence doesn’t support fast-charging. Therefore, a 2100mA or higher rated charger will enable fast-charging for any of the above iPhone models; Apple’s 10W and 12W USB chargers both fulfil this criteria. Moreover, Apple devices can request extra power (up to 2100mA for iPhone), when charging via USB 3.0 ports on Mac, which qualifies for fast-charging as well. Note: Apart from the charger, the USB cable may also affect the charging speed, as a cable with higher resistance will limit the current supply from the charging unit. So, ensure that you’re using a good quality cable that supports at least 2.1A current. Yes, it is, as long as the C-Rate of the device is close to 1C. Charging Rate or C-Rate (C) is a measure of the rate at which the battery is charged relative to the battery capacity of the device. For example, if a device with a 1000 mAh battery, capable of drawing 1000mA current, takes 1 hour to get fully charged, it is said to have a Charging Rate (C) of 1. Fast-charging supported iPhone models have a C-Rate ranging between 0.72 (iPhone 7 Plus) and 1.16C (iPhone 6), which is within the safety zone. And in case you’re still wondering, it’s completely safe to use the higher rated charger. This is because, iPhone will only draw the maximum current up to its capacity, even if the charger supplies more. For the same reason, the iPhone 5S and earlier models (along with iPhone SE) does not support fast-charging, even with 2100mA (10W) or higher rated charger. And here’s Apple’s statement from their official support page. Tip: If you’re planning to buy a new power bank, check whether it supports 2.1A output current, in order for it to qualify as a fast-charger. If you have an iPad, it might have shipped with the 10W or 12W USB charger, which can be used for fast-charging an iPhone. Check out this page to figure out its power rating. You can also follow Apple’s tips to maximize the battery life of your iOS device.